Item # 307803 Stash Points: 2,995 (?) This is the number of points you get in The Zumiez Stash for purchasing this item. Stash points are redeemable for exclusive rewards only available to Zumiez Stash members. To redeem your points check out the rewards catalog on thestash.zumiez.com. For a sporty and lightweight design, look no further than the Boys Black and Blue Stripes Jersey from adidas. This youth sized short sleeve top features a retro soccer jersey design that features blue and black vertical stripes throughout. An adidas Trefoil logo, along with adidas logo text is added to the upper chest in white, creating a signature look from your favorite athletic brand. Boys Black & Blue Stripes Jersey from adidas. 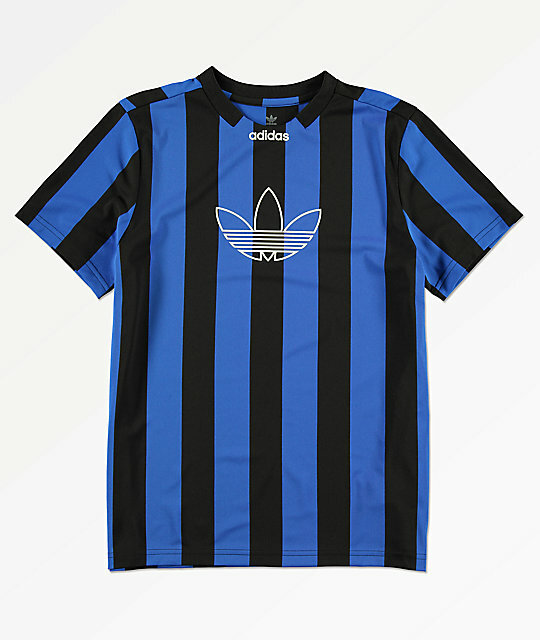 Blue & black vertical stripes throughout. Screen-printed adidas trefoil graphic at the upper chest.